Just because I stumbled over it while gathering multimedia retrieval cases I couldn't help myself sharing it with you. An interesting (and kind of funny) video showing the team that developed ARPANet, the predecessor of Internet. Widely circulated photo of the IMP Team (left to right): Truett Thatch, Bill Bartell (Honeywell), Dave Walden, Jim Geisman, Robert Kahn, Frank Heart, Ben Barker, Marty Thrope, Will Crowther, Severo Ornstein. Not pictured: Bernie Cosell. 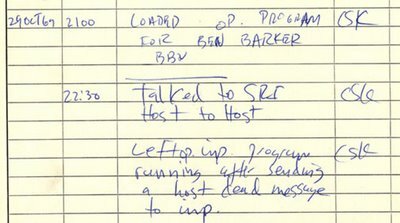 "A month later the second node was added (at Stanford Research Institute(SRI)) and the first Host-to-Host message ever to be sent on the Internet was launched from UCLA. 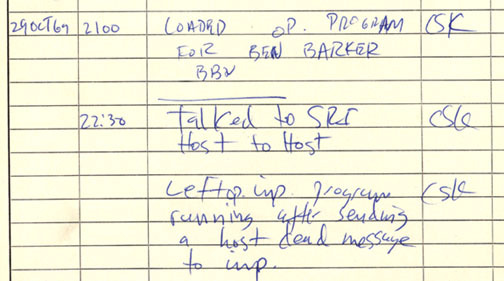 This occurred in October when Kleinrock and one of his programmers proceeded to "logon" to the SRI Host from the UCLA Host. The procedure was to type in "log" and the system at SRI was set up to be clever enough to fill out the rest of the command, namely to add "in" thus creating the word "login". A telephone headset was mounted on the programmers at both ends so they could communicate by voice as the message was transmitted. At the UCLA end, they typed in the "L" and asked SRI if they received it; "got the L" came the voice reply. UCLA typed in the "O", asked if they got it, and received "got the O". UCLA then typed in the "G" and the darned system crashed! Quite a beginning. On the second attempt, it worked fine!"